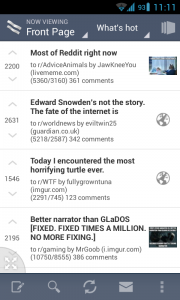 Reddit is becoming more and more one of the most popular websites around. It seems not a day goes by that I don’t read some news related to Reddit, such as a celebrity answering some questions, or the community discovering some controversy against a certain product or company. It’s becoming more and more influential, and you kind of feel like you’re missing out by at least not browsing it. 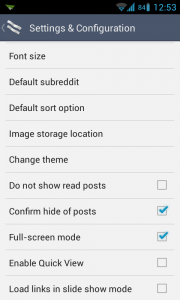 And so, as a Reddit user, I have started to search for a good way to browse Reddit efficiently on the go. 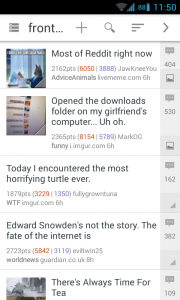 In this post, I’ll share my experiences with you and point out some features about three of the best Reddit apps for Android, and let you know where you can find them and what to expect. Let’s go! 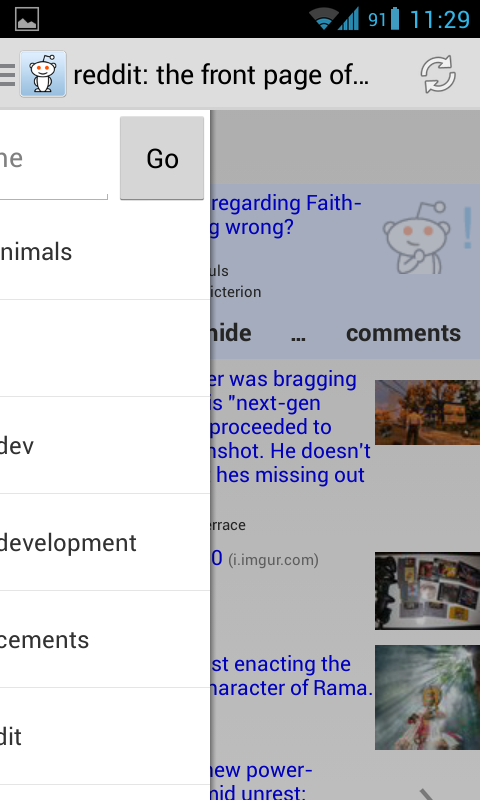 BaconReader has been around for a while now, and is one of the most popular Reddit apps on Android. It is actively updated, and is chock-full of features that show a sign of maturity and attention to detail. 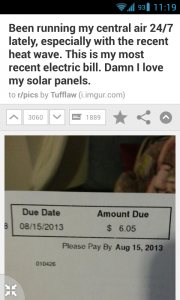 As soon as you open it, you’ll see that the UI somewhat mirrors that of the actual Reddit site, with the option to upvote or downvote right from the front page, and an option to go fullscreen without the menu bar by tapping the icon in the lower right. However, it also allows you to open the link directly by clicking on the right side of the submission, or go straight to the comments section by simply tapping the post. Inside a submission, you’ll see a very nice and organized comment view, color-coded for your convenience and easy to follow, as well as options to reply, open the link, share and see the profile of the user in the blue bar below the submission title. 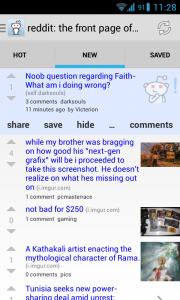 Scrolling through the comments is smooth and easy, and by long pressing a comment you’ll see direct options to reply, upvote or downvote and see the profile of the user directly. Pretty cool. As of the latest updates, BaconReader also offers an alternative “slideshow mode” UI by tapping the tiles icon in the upper right in the front page. You’ll be taken to a sort of panel view, allowing you to swipe left and right to navigate submissions, having inline content like images open automatically without you having to press anything, and options to save, upvote or downvote, share and open the comments section. 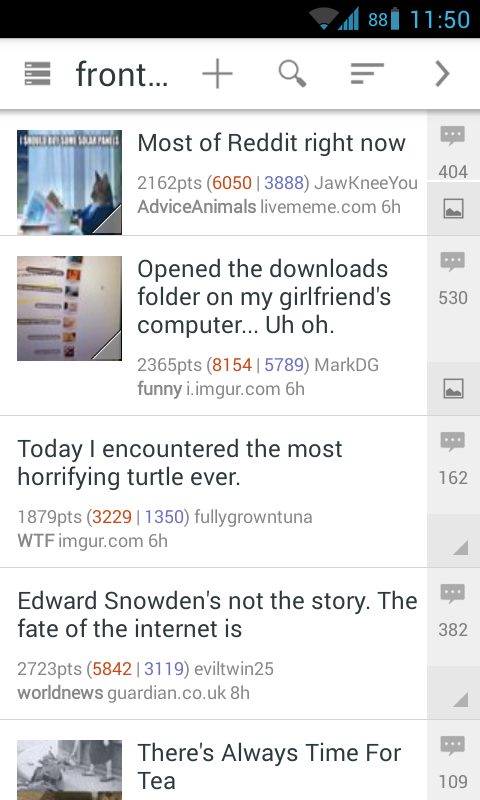 This UI is pretty nice and a cool way to browse Reddit, and offers a completely different experience. It’s also reasonably smooth and very easy to navigate, so more and more I am compelled to use this view. 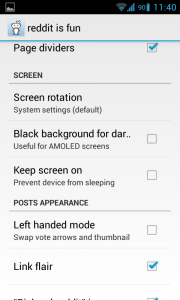 The settings are also pretty in-depth, allowing you to add multiple accounts, configure themes, choose defaults , change font size, configure notifications, messaging and so on. Basically, if you want to change something, chances are that the app allows it. You can download BaconReader by clicking here, with a premium, ad-free version here. 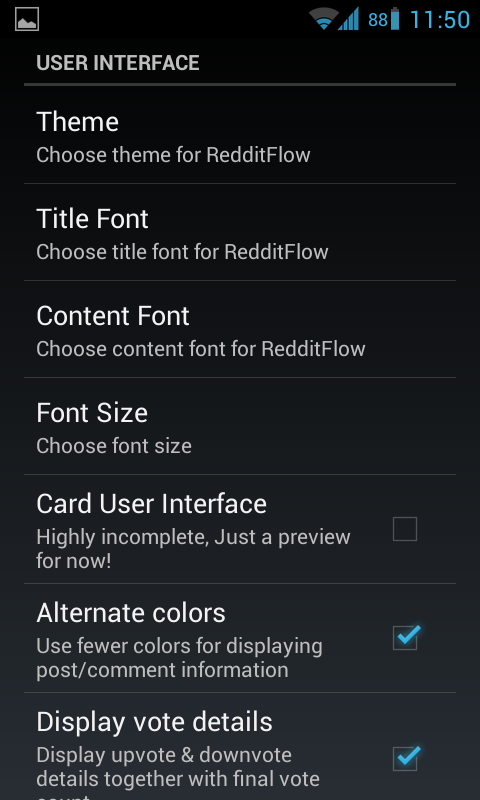 Reddit is Fun has just received a big update to version 3.0, adding a bunch of features and performance improvements. 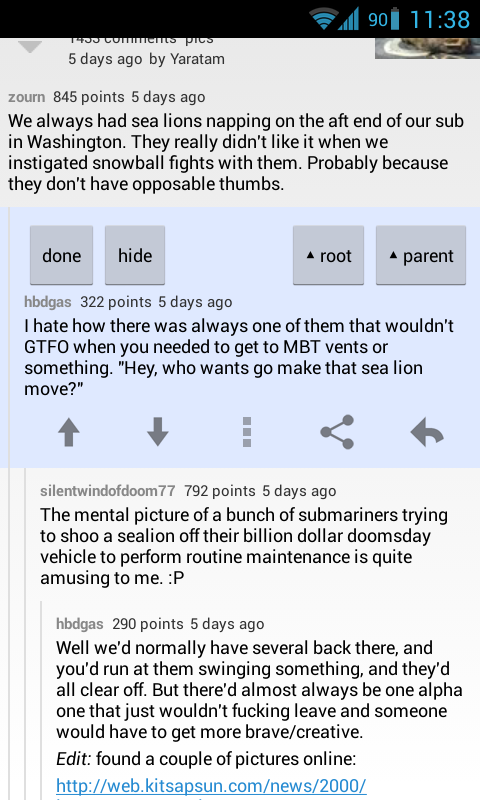 It’s also becoming one of the go-to apps when it comes to Reddit on Android, and it’s not hard to understand why. 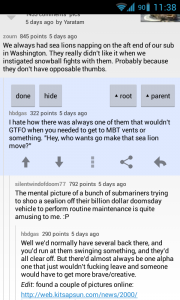 Reddit is Fun offers a familiar UI to those familiar with Reddit with a mix of Android Holo, also allowing you to upvote ad downvote from the front page, and open the link directly from there. There are also options to go straight to the comment section, and if you tap a submission you can access further options as well, like seeing the user profile or hiding the submission. I find this a bit odd, as to see the comments you need to navigate this menu and not just tap on the submission by default, which is not ideal. 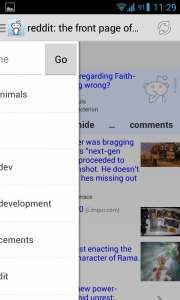 Instead of having a “fullcreen” mode like BaconReader though, it automatically hides the UI as you scroll down so that it gets out of your way. It also has a set of tabs in the top, allowing you to easily switch between preset subreddits, saved submissions and the front page. Really nice. 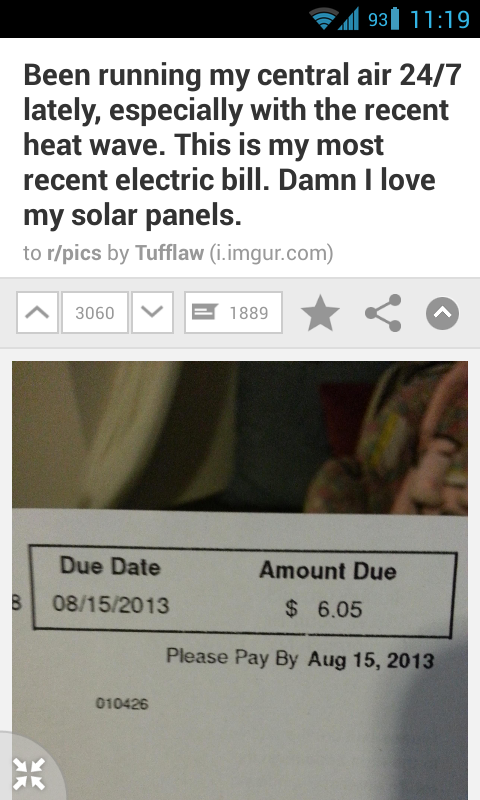 The comments UI is okay, mirroring what you’ll see on the actual Reddit site. 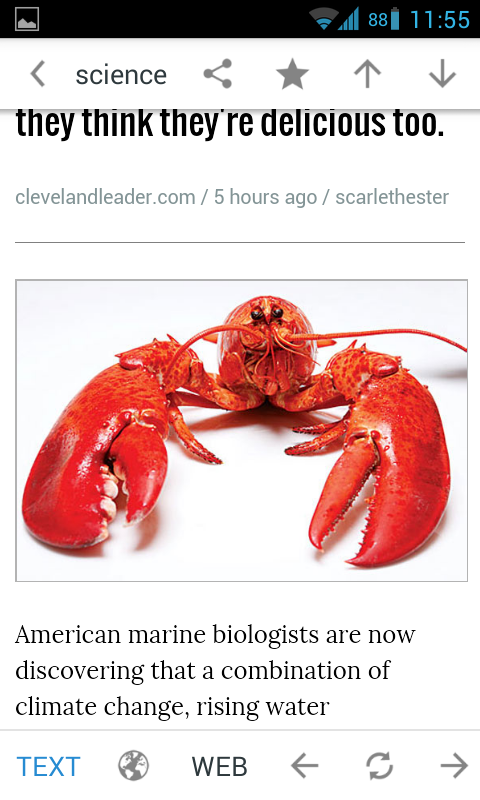 It’s not bad, but I find that I miss the color-coded option of BaconReader more often than not. Still, not too bad and very functional, allowing you to comment directly by tapping the icon of the top bar, or replying, downvoting or upvoting and sharing a specific comment by simply tapping on it, which is simple enough and stays out of your way. It’s not too fancy, but the text is readable and opening a link is also very easy within the app which already isn’t too bad. 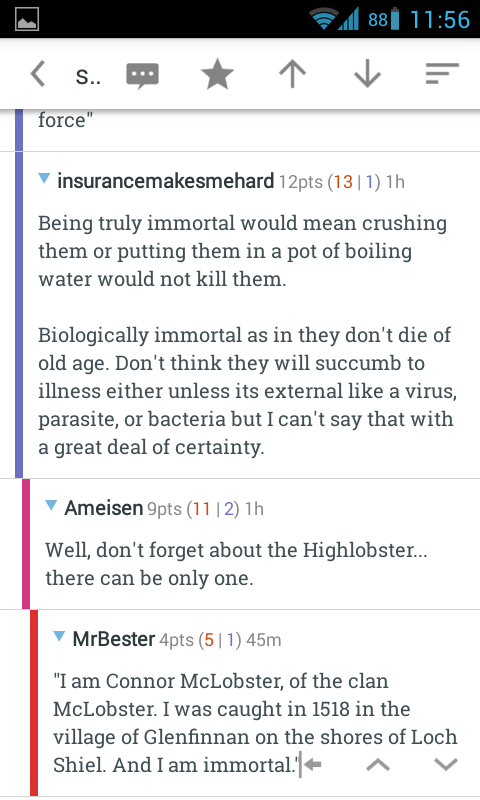 Reddit is Fun also supports themes, so you can change the UI style to your heart’s content if you’re not very happy with the defaults. 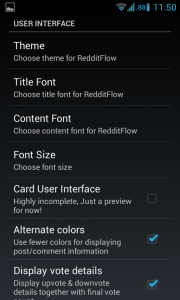 You can download Reddit is Fun though here, with an optional donation version here. This is a newcomer, but already has convinced a lot of people to switch. It is currently in Pre-Beta, but it’s stable and polished enough for daily use, at least from my observations. However, while the last two apps stick to the classic formula of trying to mirror Reddit on your phone or tablet, Reddit Flow shakes things up a bit. 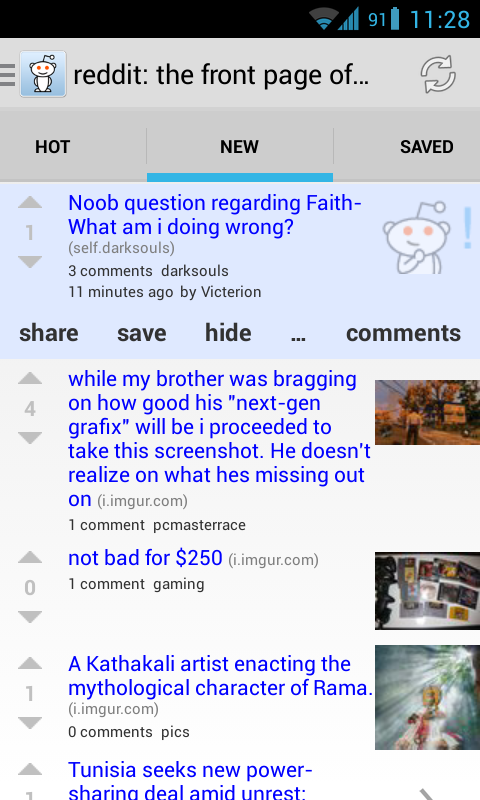 By default, it also presents a somewhat familiar interface, showing you the front page submissions, current upvotes and downvotes and so on. It also supports pulling down to refresh, kind of like the GMail app. You’ll see that the link is now on the left side though, with two icons: one to open comments and one to expand the link in the right side. What this app does differently is that it attempts to present inline content such as images without you leaving the screen, by overlaying it over the front page, and allowing pinch to zoom. Quite nice. For content that isn’t inline, the app opens the content in a stripped fashion, showing you the text and stripping non-important content. If you’re not happy with that, you can press the “Web” button below and open the link directly. This view also shows a bar with the option to save the submission, upvote/downvote and share. Swiping left opens the comment section, which is incredibly smooth and easy to navigate, as well as being color-coded and very readable. You have all the standard options in this screen, allowing you to comment directly or replying to particular comments by long tapping on them. 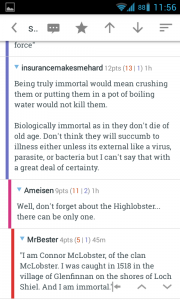 It also supports refreshing and all that jazz by pulling down, and it has an overlay in the bottom right for easy comment navigation, allowing you to advance comment-by-comment or skipping pages. 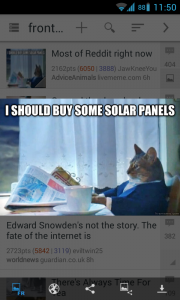 One of the fan favorite features of this app is the highly experimental card UI mode, turning the main page into a Google Now inspired app and showing your content immediately, plus the respective UI to upvote/downvote and see comments. 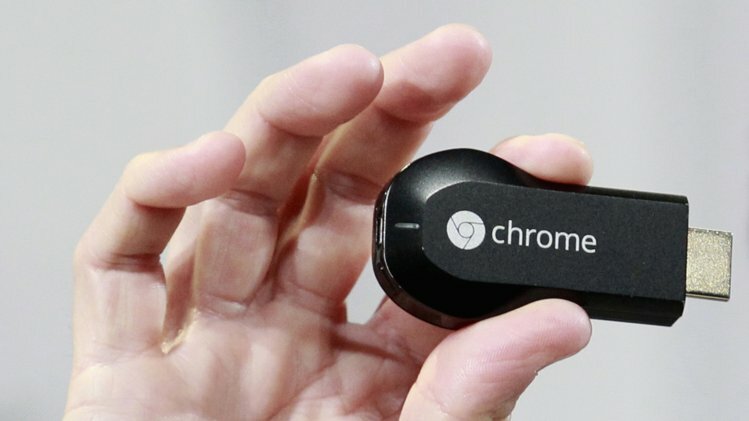 It looks incredible and it’s very usable and surprisingly smooth. 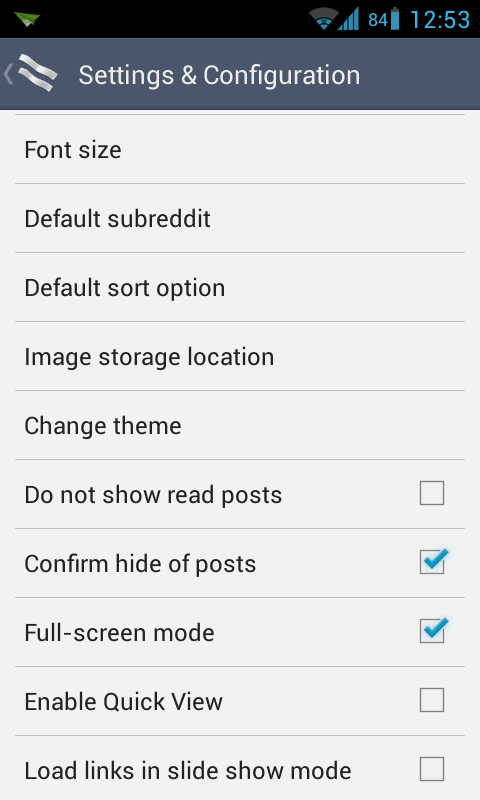 I can’t wait to see this feature reach the stable status, as it could really be a game changer for browsing Reddit in a nice fashion. 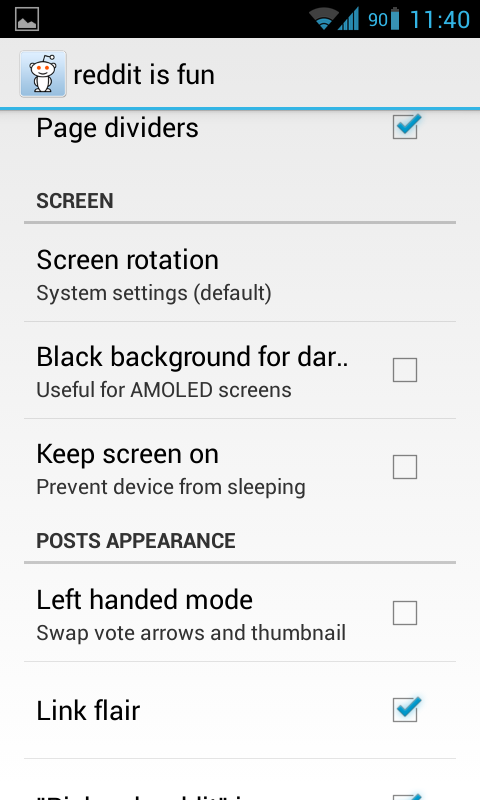 The app, despite still being in development, is already very robust and stable, and offers a bevvy of settings to configure. While there may not be as many as other apps, they do the job and all you really need is there. 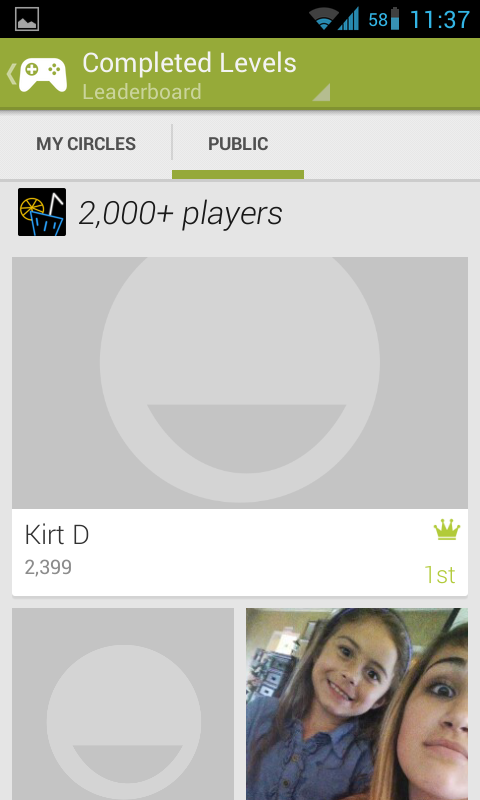 It’s a great app, and it shows that a lot of care was put into it. Another one of my favorite features is that you can swipe right and left in the front page to access a list of your subreddits and accounts, or sorting options for submissions, respectively, which makes finding new stuff infinitely easier. You can find Reddit Flow here, free of charge. 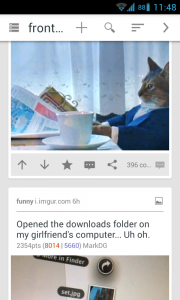 And there you go, those are my favorite Reddit apps for Android right now. 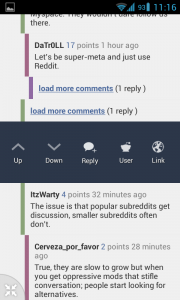 Lately I have really started to use Reddit Flow more and more, but BaconReader still does its thing when it’s needed. Reddit is Fun can also be nice to use in a pinch, but I do prefer BaconReader most of the time. I cannot wait to see Reddit Flow grow and develop further to the point of getting out of Beta, as it really does have a lot of potential and it’s amazing to use. But these are just my picks. What are yours? Let me know in the comment section below!